We will be closed Monday December 25, 2017 and Monday January 1, 2018. Our sincere wishes for a safe, happy and healthy holiday season. 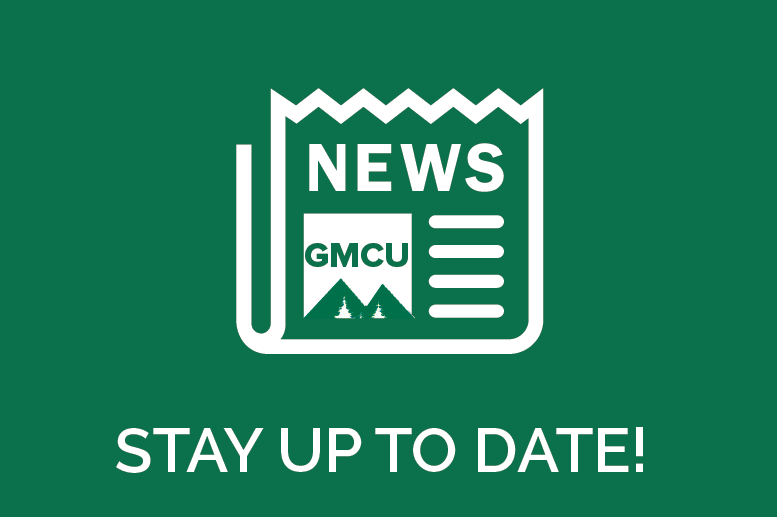 If you are heading south for the winter, don’t forget to let us know you will be traveling with your GMCU Debit or Credit Cards. We can also change your address and even enter your return date so credit union mail will be sent to the correct address. You are entitled to receive one free credit report every 12 months from each credit reporting company, Trans Union, Experian and Equifax. These three major credit bureaus have formed a site to make it easier to get a merged report, www.annualcreditreport.com , the only site authorized by federal law to receive your free annual credit report. Ensure the information on your credit report is correct and up to date. Fight identity theft by monitoring and reviewing your credit report at least annually. Beginning Friday, September 15, 2017 the second phase of same day processing goes into effect. Payments will move faster for not only credits or deposits to your account but also for debits by check or ACH. For example, a payment for your utility bill or car repair may be pulled from your account on the very same day the check or debit was made. 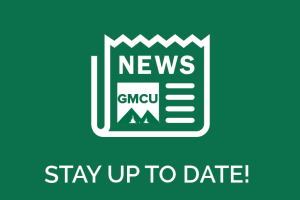 Keep up to date on your balances by checking your account online at www.greenmountaincu.com. If you haven’t already signed up for Online Banking, send a request from the Contact Us button, or call any branch office to sign-up. It’s hard to believe but it’s almost that time again. Christmas Club Accounts will be transferred to your regular share account on Friday, October 6, 2017. If you have automatic deposit to your club account it will continue for the new 2018 club accounts unless we are notified otherwise. Now is the time to sign-up for a 2018 Christmas Club Account if you don’t already have one. Put as little or as much as you want in the account and have ready cash for next year’s Christmas shopping. Download our new MOBILE APP now available in the Google and Apple store. Information on the Equifax Breach from the Office of Vermont’s Attorney General and be found here. Green Mountain Credit Union is Going Greener! We are installing ELECTRONIC SIGNATURE PADS in all offices during the month of August, eliminating the need for paper receipts. Check your balance, make transfers between your accounts, and pay bills with our New MOBILE BANKING feature, available for FREE in the APPLE STORE and GOOGLE APP STORE in late August. Snap a picture of your checks for deposit from the comfort of your home or office with our New Remote Deposit Capture feature. Sign-up information for this feature will be available by the end of August also. Links to the Mobile Apps and Sign-up forms will be available on the website as soon as they are available. Welcome Amanda Elwood, Teller/MSR in our Berlin Office. Please welcome two new employees: Thelma Jackson, Loan Officer in the Rutland Office and Heidi Bowers, Teller/MSR in the South Burlington Office. Also, congrats to John St. Hilaire & John King for being reelected to the Board of Directors for 2017-2018. Our Online Banking will be sporting a new look and expanded features. New and reissued Debit Cards will carry EMV (chip) capabilities. 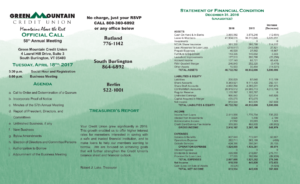 The 58th Annual Meeting of Green Mountain Credit Union will be held on Tuesday, April 18, 2017 at the South Burlington Office, 4 Laurel Hill Drive, South Burlington, VT 05403. Social Hour and Registration begin at 5:30 p.m. and the Business Meeting at 6:00 p.m. No reservations needed. 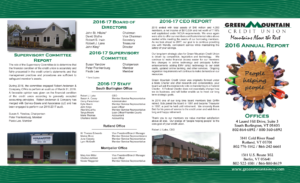 The Annual Report is available below and has been mailed with the March statements to members. For additional copies or more information, please contact any office. Please help us welcome Katon Bushey who is replacing Alex McCarthy in the South Burlington Office. Alex has accepted the position of Operations Specialist/Internal Compliance Officer in our office. Also please help us welcome Lynn McGrath in our Rutland Office. Lastly, Charlie Litchfield of out Berlin Office has left for another opportunity and we wish her well. For your convenience, our South Burlington Office will be acquiring a coin counting machine in the near future. Trading in all those pennies, nickels, dimes, and quarters for paper money will be easier than before. Currently we have two loan specials going on. Our Tax Loans and our Home Improvement Loans. Have you completed your taxes, only to find out that you owe more than anticipated? Is your income tax refund taking a bit too long? Apply for a Tax Loan, with Rates as low as 4.99% APR. Looking to make Home Improvements? Choose the right tool to get the job done. Home Improvement Loans are available, with rates as low as 3.49% APR. Contact one of our loan officers for more information on both. Would you like to have your loan payments debited from another bank or credit union? This service is now available to our members at no cost. Contact any office for more information and to sign up. All we need is your signature and a cancelled check with the routing and account numbers. In more ACH news, have you noticed your ACH debits and credits posting faster? A new regulation this fall enables us to process these items three times a day instead of only once, early morning and then twice in the late afternoon. We are working to bring EMV or chip cards to your Debit card during the third quarter of 2017. Also to transition our VISA card to the Flex core system so it will appear on your credit union statement and online banking by the third quarter. New online banking and remote deposit capture are also on the calendar. Watch this newsletter for more information as these technology changes evolve. Please help us welcome Kylie Hearn who is replacing Marie Hill in the South Burlington Office. Marie has left for another opportunity and we wish her well. The Holidays are swiftly approaching, 2016 Christmas Club accounts were dispersed to regular share accounts on Friday, October 7, 2016. If you have an automatic or direct deposit to a club account it will be directed as usual for your 2017 account. Now is the time to sign up for 2017 Christmas Club Accounts if you don’t have one currently, contact any office for more information. By popular demand, our Holiday Loan is now available for early shopping. This loan pays off in 11 months and rates start as low as 5.49% APR. All Offices will be closed on the following dates, Call 24 and Online Banking will be available 24/7. It’s hard to believe that summer is almost gone, school has started and you can see some of the leaves changing already. If you are heading south for winter, don’t forget to let us know you will be traveling with your GMCU Debit or Credit Cards. We can also change your address and even enter your return date so credit union mail will be sent to the correct address. Time to think about buttoning up your house for winter with an Energy Loan from your credit union. Use the loan for any type of energy improvement such as extra insulation, a wood stove and even energy efficient appliances. We will also have our Fuel Loan available for members that want to pre-buy fuel or need extra fuel during the winter. Holiday sales start earlier and earlier it seems. For members who enjoy shopping early, Christmas Clubs will be disbursed on Friday, October 9th to your regular share account. If you have payroll deduction or automatic transfer, your Club for 2017 will automatically continue. It’s great to have funds on hand for a worry free holiday. don’t have a Christmas Club account? Start one for as little as $5.00 by calling or visiting any office. The 57th Annual Meeting was held on Friday, May 20, 2016 at the Berlin Office of Green Mountain Credit Union. Members enjoyed a barbeque dinner with three kinds of salads and hamburgers cooked on an outside grill. Thank you to member Chad Perkins for making the salads and bringing the grill for the evening. The business meeting was called to order at 6:15 p.m. by CEO Bob Lake. The minutes of the 56th Annual Meeting were approved as written. Nominations to the board include David Blythe, Robert F, Irwin, and John King. There were no nominations from the floor. The slate of nominees was approved as presented. Recognized for their years of service were retired directors Ture Nelson and Bob Griffin. Ture served on the board since 2006 and as Vice Chairman and Bob since 1991 and as Treasurer. Their names will be placed on a plaque in the lobby of the South Burlington Office as Volunteers of the Year. The winner of the drawing for a $500 cash prize was won by Scott Miller. There being no further business the meeting adjourned at 6:40 p.m. Immediately after the meeting, the directors met to elect officers for the coming year. They are John St. Hilaire, Chairman; David Blythe, Vice Chairman; Robert F. Irwin, Secretary; Robert J. Lake, Treasurer and John King, Director. The 57th Annual Meeting will be held on Friday, May 20, 2016 at the Berlin Office. Join us for a free barbeque and the chance to win $500. The business meeting will begin at 6:30 p.m.
David Blythe is an attorney in Barre and is a partner in the law firm of Blythe and Taylor. He was appointed to fill the unexpired term of retiring director Ture Nelson. John King is the owner and President of TELigence Partners, an IT telecommunications company. He was appointed to fill the unexpired term of retiring director Robert Griffin. Robert Irwin has been on the Board of Directors since 2011 and currently serves as Secretary of the Board. Director Robert Griffin has retired from the Board of Directors. Bob joined the Board in 1991 and served as Treasurer for most of that time. During his tenure on the board the credit union grew from $3 million to $43 million. Bob’s insight and contribution to the financial picture of the credit union will be greatly missed. Bob recently retired from a long career at Green Mountain Power Corp and is enjoying his retirement traveling and enjoying time with family. After posting and interviewing candidates, the Board of Directors appointed John King, President of TELigence Partners, a telecommunications and IT consulting company, to fill the unexpired term of Bob Griffin until the next annual meeting on May 20, 2016. I would like to take this opportunity to review our successes and share them with you. Over the course of 2015 we saw our “project growth” create efficiencies and reduce expenses without adding new positions. This enabled us to grow our assets to $40 million and generate the highest profit and number of new members in our history.